For a full month almost we have been basking in exceptionally warm and dry weather conditions – in many ways this allows the garden to be seen at its best – but of course as always it also brings a few unexpected problems. The first of these was a thunderstorm deluge on first day of the month which washed away large sections of the track in under an hour – all the necessary repairs were made and potholes filled in so hopefully this will stay intact now for the rest of the season. The other main problem from the prolonged dry spell is of course water supply. The spring source has dropped to a low level and the supply is erratic – it is noticeable in both aqueduct overflows drying to a trickle and the Temple pond receding and evaporating from its edges. The ponds and burns are kept clear of weed and silt as much as possible to keep all running as best as can be. The larger job of weeding out the loch has also been completed and this too should see us through the season – the water looks clear and sparkling and the whole area around is bright with an abundance of wildflower blooms. New trees have been planted – Scots pine and willow in the bare areas at area end of loch, copper birch to replace those damaged in the woodland, a few more specimen oaks dotted round, and blackthorn and alder opposite the Nuclear Sail. All of these have been brought on from tiny cell plants over the past few years so It is satisfying to see them now taking their place in garden. A few more dog roses have been put in along the perimeter of the wild garden woodland – softening the fence adjoining us to the farmland – it will soon provide further splashes of colour under the canopy gloom. Planting also continues in front of the temples and in the sunken garden – cosmos, calendula, salvia, viola – taking out some of the overwhelming presence of sweet Cecily and introducing a diversity of colour and form. The repaired grass paths have germinated – the young grass blades have been flattened underfoot by much pedestrian traffic – but might still perk up and survive. 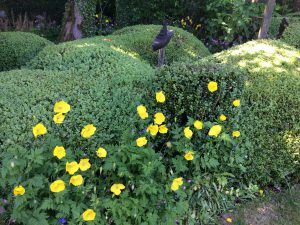 There is much strimming to be done to cut back new growth throughout the garden – and keep things from becoming too rampant or dominant. The box hedging in the Hortus is trimmed tight and the beds cleared out- the roses have survived and their underplanting of nepeta. White foxgloves have been planted in the long bed along the back wall looking in – which will give a nice contrast in colour and form. The perennial war on rose bay willowherb continues apace – as an experiment the new flower heads have been loped off to see if this retards growth this season – at least the whole hillside will not be dominated by their bright purple tresses all summer. Around the front of the Grotto as much of the willowherb as possible has been removed and gradually new planting can be introduced here. Also some old accumulations of dead wood has been cleared away from this area, bringing in more light. The large yew hedge at the top of the Parkland has its annual trim and is neat and tidy. The wooden bridge in the Temple garden has been repaired with a new support. The slate top of the Monument was taken off and cemented back in place after damage from last year, but almost immediately cattle are back in the field and cannot resist the temptation to rub themselves against it – the slate has shifted again, but is easily pushed back Ito place – a more permanent solution will have to be found to make the top cattle proof. It has been a busy few weeks but all is well under control and the delights of the garden there to be enjoyed.